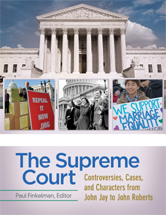 After an introduction and overview to the history of the Supreme Court from 1789 to 2013, this book examines the Court's decisions chronologically by Chief Justice, allowing readers to grasp how the role and powers of the Court have developed and shifted over time. The chapters depict the Court as the essential agent of review and an integrated part of the government, regardless of the majority/minority balance on the Court, and of which political party is in the White House or controlling the House or Senate. Chapter 6: The Waite Court - Donald Grier Stephenson, Jr.
Chapter 7: The Fuller Court - James W. Ely, Jr.